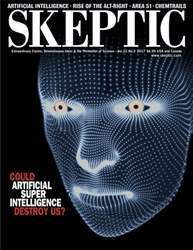 Digital Subscriptions > Skeptic > 22.2 > Area 51: What is Really Going on There? We are driving west in a black SUV across the “Extraterrestrial Highway” (Nevada State Highway 375), about three hours north of Las Vegas. The road itself is unremarkable—miles and miles of a ribbon of asphalt cutting across barren desert with mesquite and Joshua tree yuccas the only signs of life anywhere. Occasionally the road rises up from the low flats to cross a small mountain range, with jagged rocks exposed on all sides, completely devoid of vegetation. During the summer, the daytime temperatures here stay above 100°F for weeks on end, so few come through here. In the winter, the daytime temperatures are more comfortable, but at night it gets bitterly cold, especially if the desert winds are howling. It’s over 4400 feet in elevation, so some winters are cold enough that snow accumulates on the high desert surface, and may persist on the peaks well into spring. After you pass through the tiny towns of Alamo and Ash Springs on U.S. Highway 93 (last gas station for 150 miles or more), and turn west onto Highway 375, you drive about 15 miles before reaching Hancock Summit, a mountain pass through barren rock that is the highest point in the region. You can get out of your car and look to the southwest, but all you will see is the Groom Range. Area 51 is hidden in the valley beyond, and there is no other spot in any direction where you can see the base from a paved road. You could make the strenuous hike to Tikaboo Peak to the south to see parts of the base on the other side of the range without incurring the wrath of base security, but at 26 (42 km) miles away it desn’t provide that much more information. The isolation of the base was deliberate. Its location was chosen to be as remote as possible and impossible to see from the paved road. Until recently, the only way to see the base was by airplane. But the entire airspace above the base is restricted, so unless you want to be chased away by fighter jets, you don’t try to fly over it with a civilian craft. Then, when spy satellites and especially Google Earth became available, it was possible to get satellite images of the base. All these show are a series of airstrips and a bunch of buildings down on the valley floor next to the dry Groom Lake bed. You can infer that there is some sort of military activity there, but nothing worth getting excited about. It looks just like any other military airstrip in a desert.